You could say Kenlyn Arabians was born out of a death. "In 1973," says Linda Fisher, founder of Kenlyn Arabians in Aurora, Colorado, "I had my first purebred Arabian, and I was going to take her to Tevis. She was a spectacular horse." The Tevis Cup had been Linda's endurance riding goal for some time, and she knew she had the horse in Haycrest Zendina. She also had, as a mentor for conditioning, a British Olympic team rider. It turned out that right before Tevis, Linda's mare died of colic during a drastic change in weather temperature. It also turned out that her mentor, Minette Rice-Edwards, went on to not only finish Tevis in 4th place aboard Bright Hope, but to also win the Haggin Cup. "I was so devastated after that mare died. I'd always wanted to breed horses, and that mare was part of my plans. I asked my accountant, 'What am I going to do?' and he said, 'Well, we're going to get you a name. Pick a name for your breeding business.' My husband is Ken and I'm Linda, so the name became Kenlyn - Kenlyn Arabians. "After teaching high school and having two kids, I decided to be a stay home mom, and I was going to become the breeder I always wanted to be. "I was 15 [in 1965] when I bred my first horses. I bred my Standardbred trotter mare and a Quarter horse mare to the Arab stallion across the street - he turned out to be an Abu Farwa son. Those two half Arabian babies were so fabulous. They won everything for us - horse shows, endurance rides, CTRs (Competitive Trail Riding), everything. And I just wanted to start eventually getting into purebreds too. And so Kenlyn Arabians became a reality after that mare died. "Most people don't start businesses when their business fails!" And most people don't have the longevity and determination and focus that creates and sustains a breeding business for half a century, but when Linda sets her mind to something, count it done. "I've been a focused horse person since I was born. My mom said I could whinny before I could walk," she laughs. "We didn't have horses, and they didn't care for horses at all. But when I was 11, they got me a horse, and boy, I was horse crazy ever since." 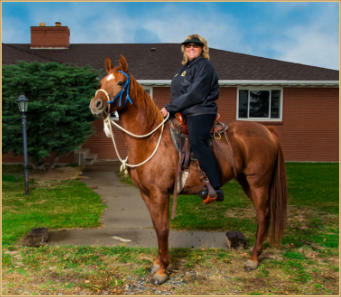 With Kenlyn Arabians set up, Linda plunged into the breeding, shrewdly acquiring the best mares she could, and breeding to the best stallions she could, and pursuing what she needed to do to get the word out about her homebred horses. "We did horse shows, endurance riding, NATRAC (North American Trail Ride Conference), everything. I really tried to make sure I sold my horses to the best people I could who would do things with them." Linda wasn't necessarily specifically breeding endurance horses; she was just focused on breeding good horses. But it's not surprising so many of those turned out to be good endurance horses. "I bred to the best Arabian stallions in the country: Khemosabi, *Bask++ sons, Barbary, a lot of the big famous names that were National Champions." The first stallion that Linda purchased for her purebred Arabian program put her on the map as a breeder. She acquired Miraffles (Azrhand X Mira Roga, by Ibn Rogue) in the early 1980s. Linda recalls, "He was a US National Top 10 Halter Stallion, a Western Pleasure Champion. "And he was probably the most correct, perfect horse I've ever owned or seen. He was a Crabbet horse, and what he lent to my program was not only beauty, correctness, huge big feet and bones, but low, low heart rates. Almost all the horses that I've bred go back to him at some point in their pedigree. I still have a couple of granddaughters of his, considering he died 20 years ago or so." Linda employed trainers who showed and won with her horses, and even though they beat the millionaires' horses, Linda just couldn't sell her horses to the people they sold to. "It was very frustrating," she says. "At one point I realized I had to go back to my roots, which was riding all over the hills and just doing the endurance stuff. Trail riding was my forte; that was what I could do well. I thought maybe I could be a David Boggs [founder of Midwest Arabians] in the endurance world and make a name for myself, because endurance was something I could do myself. "I no longer had to spend all the money on the trainers, and I rode and enjoyed my horses myself. I took all those great mares and started competing them, and they were good horses." Linda pauses, then amends that: "They were great horses. "One of my mares, Kouver Girl (Kouvay Bey X Subtle Diversion, by Kaiyoum), was filly of the year in Colorado as a weanling, yearling, and a 3-year-old in the show world. Then she went on to do Tevis for me, and be first in the overall standings in the Mountain region for 50 milers and 100 milers. She was just one of my show horses that became my endurance horses. "What I used to do is breed a mare, and if I made the great baby I thought I did, I'd breed the mare again and again. One would stay home and be the mother, and one would be out there promoting that bloodline. So while Kouver Girl was doing great things on the trail (2355 miles in 7 seasons, 47 completions in 49 starts), her full sister Kourvacious was producing foals." Many of Linda's endurance mares went into her breeding program. "I kept a lot of my mares to breed if they'd performed well. I probably have bred over 500 foals. I've had US National Champions in Western Pleasure, Scottsdale Champions in cutting. One of my babies was Canadian National Champion in reining. And even jumping. One winter we took 6 horses down to Scottsdale, and every single one of them did Top Ten in jumping, and 1 was Reserve Champion of the whole show in jumping. That was fun!" In other words, Kenlyn Arabians are all-around superior athletes. "That's what I'm trying to do, produce not only a beautiful horse but a very athletic horse. Most people when they're trotting down the trail will go, 'Is that a Kenlyn horse?' because it's beautiful and a talented athlete." I love this story. So much I didn't know. What a great tribute to Linda.